It’s a concept, really. An idea that often, the answers are right in front of us. But because we’re so consumed with the pace of our lives or our priorities of the moment, we overlook the obvious. ReThink is a reminder, an invitation to think again about the things we already know, but have somehow forgotten. It’s not fancy and spit-polished and sophisticated for the sake of being profound. It’s much simpler than that, really. 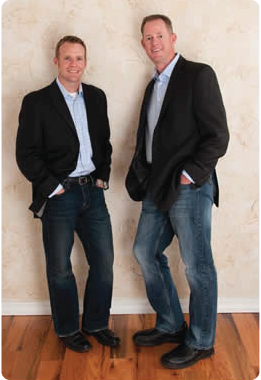 It’s two guys asking you to do the unthinkable: rethink the basics. You’ve heard keynote speeches and attended training sessions that left you bored, uninspired, and wondering how any of it applied to you. We know because we’ve been there too. Same old song and dance. That’s why we think you’ll like our style. We’ll inspire your organization with a keynote experience like none you’ve ever seen. We’ll knock over the apple carts and topple the sacred cows with energetic training and development workshops – and you’ll be able to apply them to your work and your personal lives right away. Ron Rabou is a true entrepreneur with more than 20 years of public speaking and private business experience. Even today, Ron owns and manages multiple companies, including a farm, numerous real estate interests, and a hunting and guiding business. It’s that experience which drives him to inspire companies, non-profits and student groups to improve their communication, their relationships – and their results. Steve Bahmer is a former award-winning journalist, leader of a technology company, and founder of his own public affairs company. Steve has been speaking to corporate and non-profit audiences for more than 15 years, weaving his business experience and unique personal story into challenging, motivating presentations. 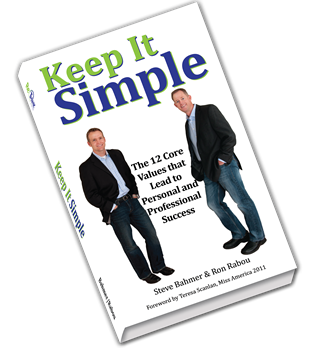 Together, Ron and Steve deliver keynote speeches and training programs like none you’ve ever seen. ReThink was born at a restaurant in Cheyenne, Wyoming. During a long, wandering lunch conversation, we lamented an unfortunately common reality that appears to have infected American business and education: in our efforts to solve problems, we tend to overcomplicate. Don’t get us wrong – we understand that 21st-century organizations face complex problems. Solving them requires thought, introspection, and commitment. In the end, though, the solutions tend to be fairly simple. They’re not necessarily easy, but they’re very simple. We decided that day to create ReThink – our contribution to the conversation. Our tools? Products that remind us about the basics. Clothing that communicates a message of simplicity, hope and strength. Entertaining, energetic, thought-provoking keynote speeches like none you’ve ever seen. And training programs that really engage your audience and connect with them in ways that are truly meaningful. Our goal? To deliver our central message: most of the issues we struggle with – whether they’re professional or personal – can be resolved if we’re willing to rethink the basics. Thank you to Miss America 2011 winner, Teresa Scanlan, for writing the foreword of our book! © 2015 ReThink The Basics. All Rights Reserved.